Halloween is just around the corner, which usually means that you’ll soon find yourself buried under a mountain of leftover trick-or-treat candy and searching for ways to use it up. 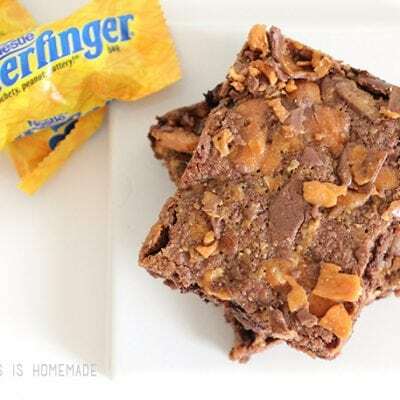 These yummy double chocolate cookie bars can be made with any kind of chocolate candies, but today I’m using Butterfingers because that’s what we had in our pantry. 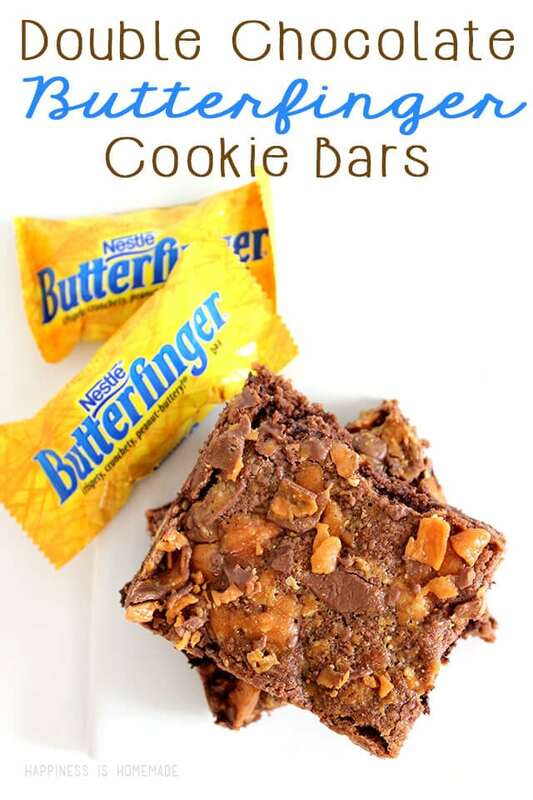 These chocolate cookie bars are the perfect combination of gooey soft cookie and crisp crunchy candy pieces! In a large bowl, cream together the butter and sugars. Add the eggs, vanilla, and pudding mix, and mix well. Add the flour mixture to the large bowl, and stir until combined. Stir in chocolate chips and 1/2 of the chopped Butterfinger bits. 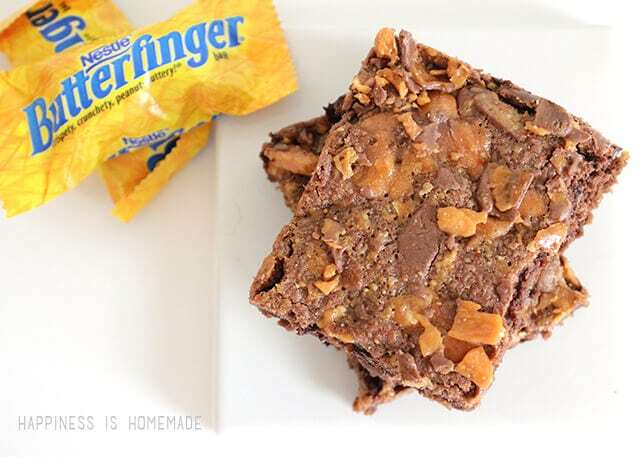 Put the mixture into a 9x13 baking pan, and top with the remaining Butterfinger bits. Bake for approximately 20 minutes or until a toothpick inserted in the center of the bars comes out clean. Cool for 30 minutes before slicing and serving. 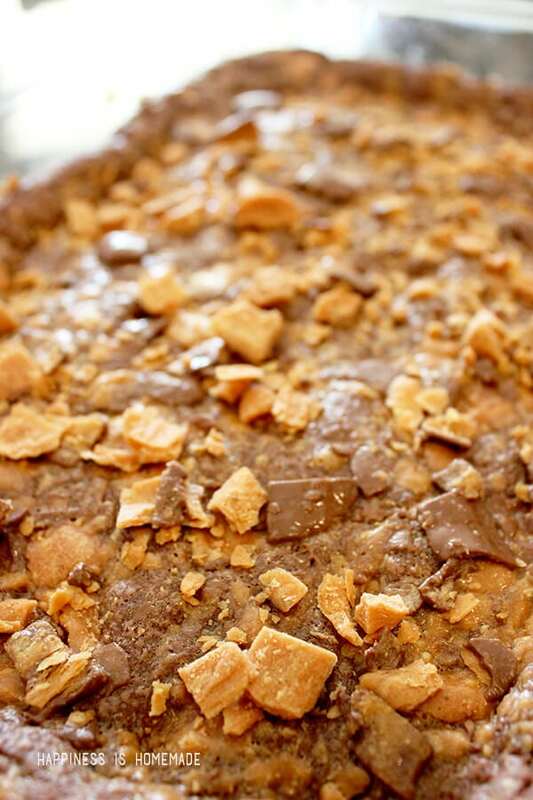 I personally think that these cookie bars taste even better the day after you bake them…if you still have any left over! They tend to disappear rather quickly!